You can listen to the new Komety single "Upiory w szuwarach" ("Ghosts in the Rushes"). This is the cover and the tracklist of the Komety live album "Bal nadziei" out now on Thin Man Records. In the Extras site you can watch the new Komety video "Bal nadziei" directed by Kuba Dąbrowski and starring Daisy Dot. This is the cover and tracklist of the new Komety album "Paso Fino". It will be released in March 2014 on Thin Man Records. 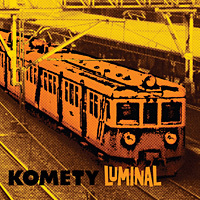 The new Komety album "Luminal" is out now. Here is the cover and the tracklist. "Eighteenth Birthday" is the title of the first single taken from the "Luminal" album. You will be able to listen to the new song at www.myspace.com/komety on the 21st of March. New T-shirts available in the Merch section. Mexico's Esquilo Records has put out "The Story of Komety".